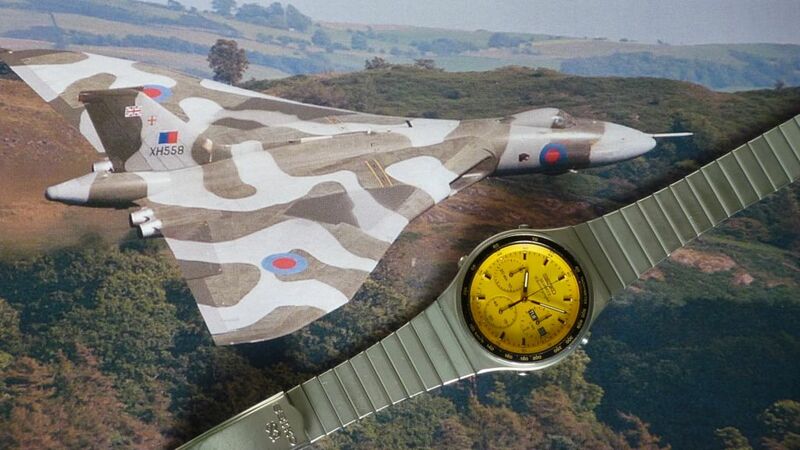 7A38-701B Vulcan 'Pie in the Sky' on MWR forum (and it concerned just that particular watch of the original title). I thought I'd first move it here. We can then move the thread again - to the 7Axx Model Specific area (where it really belongs) later. Hopefully it won't end up quite as long as the 13-page (184 post long) epic tome that I started on the UK RLT forum, back in 2009. 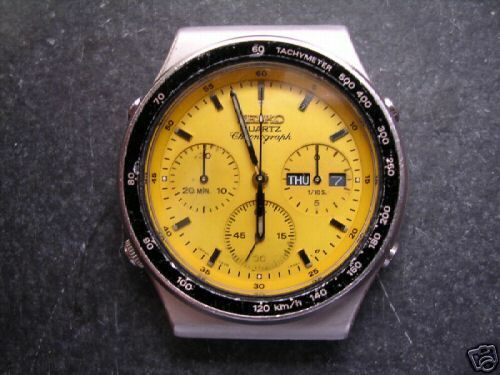 For Sale: Seiko 7A38-701B Chronograph "Vulcan"
I have a Seiko 7A38-701B for sale, commonly referred to as the "Vulcan Bomber" watch but that myth has been debunked plenty of times before and I won't go into it here. 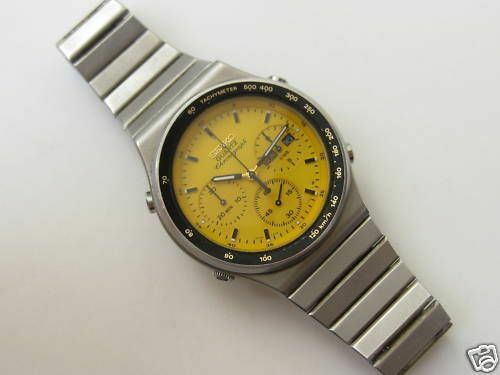 These watches have supposedly turned up amongst other issued pieces from MOD stores, though no documentation has actually been found to substantiate this. 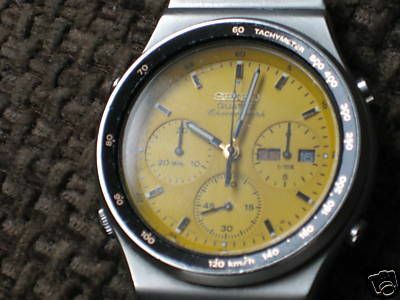 This one is in used but not abused shape, the only flaws I can see apart from the worn bezel insert are a small spot of yellow paint that has flaked off from the "0" of the 1/10 sec counter and some marks on the outer edge of the dial between the "10" to "15" markers. Functions and timekeeping are all correct and working. Crystal is clear and no visible scratches. 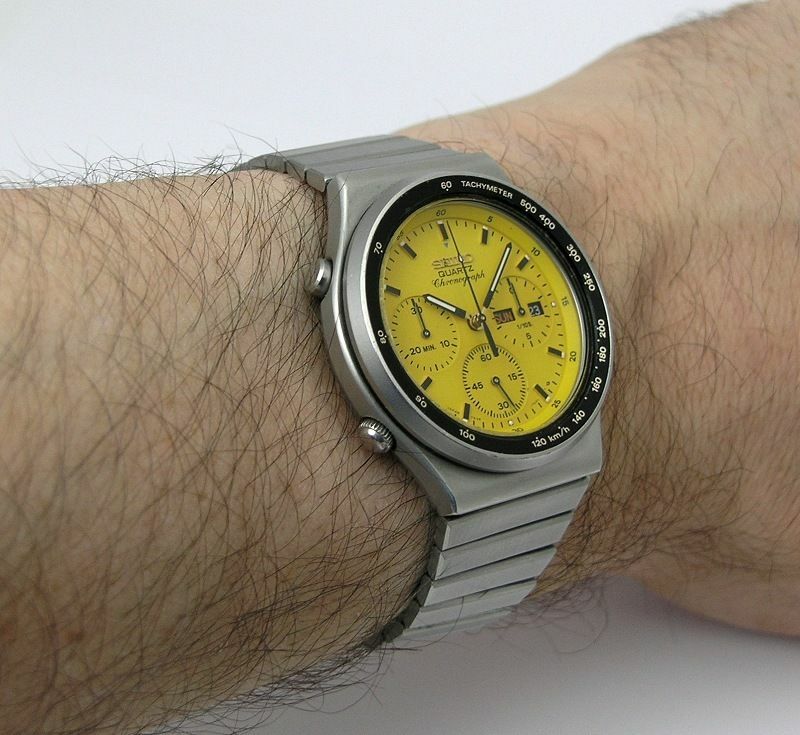 Comes on an aftermarket Seiko-signed "Speedmaster"-style bracelet that is a millimeter too narrow at 19mm (the watch actually takes a 20mm bracelet). Price is £300 which includes registered signed-for delivery anywhere in the world. I accept PayPal and will absorb the fees. Thanks! Not quite sure what makes 'Bobsy' think this rather dog-eared example of a 7A38-701B might be worth £300. Belated edit to this post : See below - it's probably got something to do with the price he paid for it, a little over 6 months ago. I'd been scratching my head, trying to remember where I'd seen that 7A38-701B currently offered for sale on MWR forum before. Rare indeed. 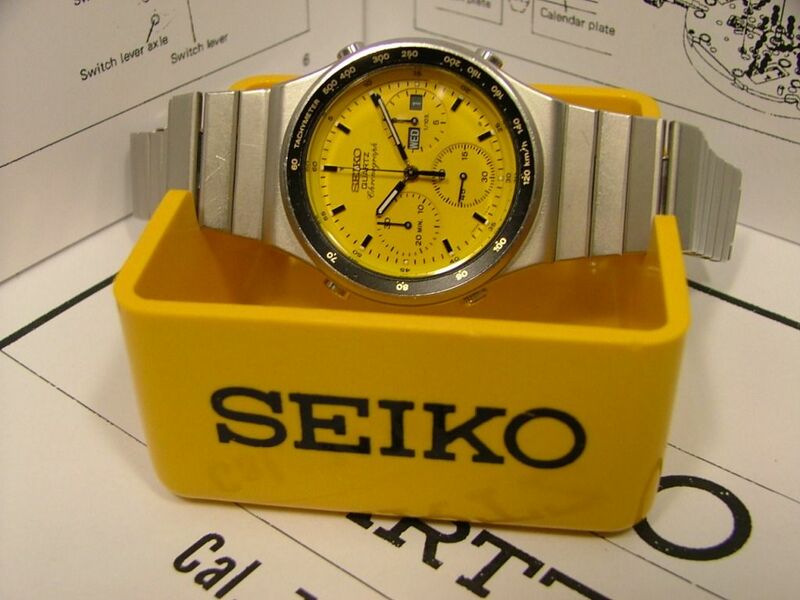 The yellow faced Seiko known to be worn by RAF Vulcan bomber crews. 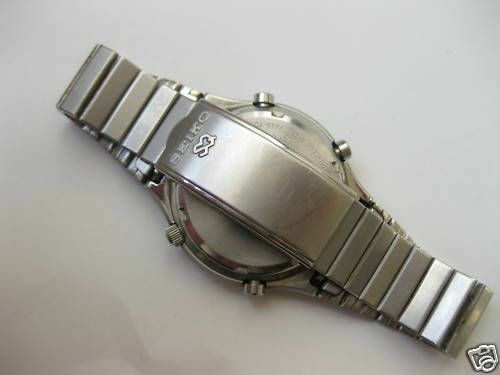 Bezel is somewhat worn. Glass is clear. Keeps excellent time. I don't think I could have got any luckier, wading back through eBay to find an auction which ended (early, at that) 12 months ago. 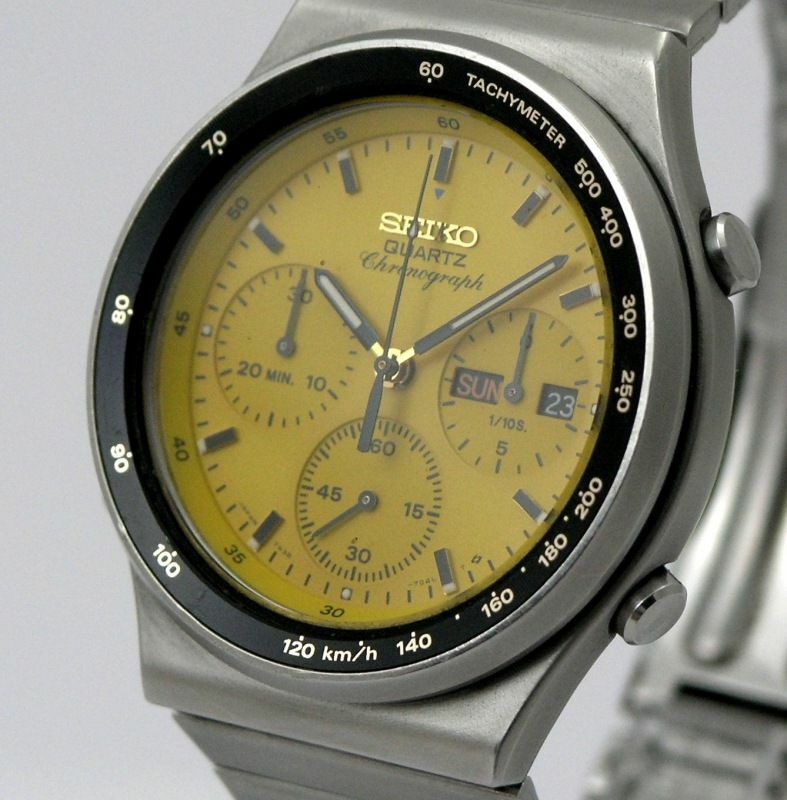 Beautiful and hard to find Seiko Chronograph Tachymeter sport watch. Like new condition, worn only a few times. The auction had an opening bid price of $20, and IIRC, the reserve was set at $150. I believe it sold off eBay for in excess of $500. 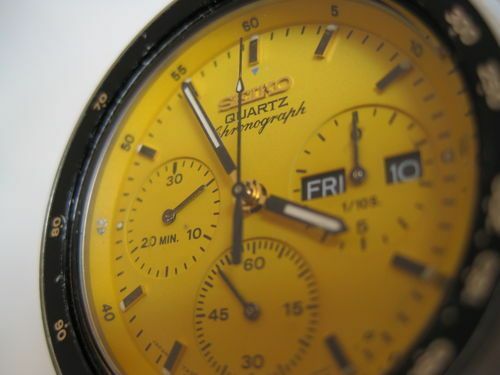 In the seller's first photo, the bezel inlay appears to have a missing flake of enamel - adjacent to the 55 mark on the minute ring. 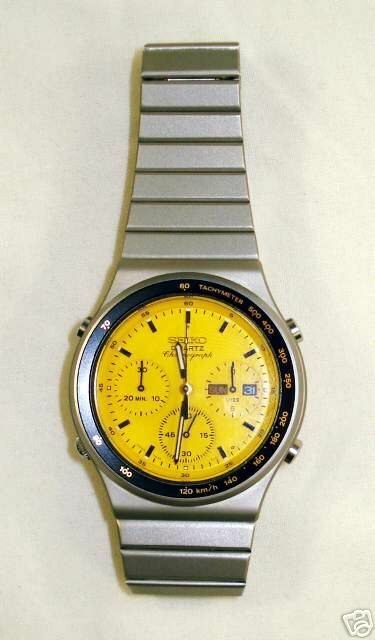 The watch was purchased by the UK-based collector and dealer, Archer Mclean - better known in the digital world as 'bigmacnofat'. 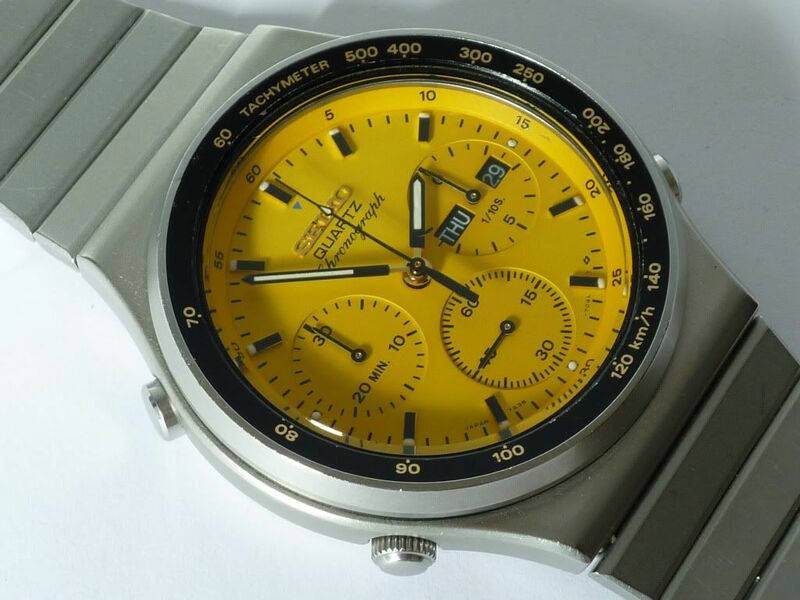 Up for auction is a stunning Seiko 7A38-701B chronograph, sometimes called the 'Vulcan' because of urban legends associating this yellow faced watch with the RAF Vulcan flight crews (and subject to much internet debate!). It has been worn, but is in very good condition bearing in mind its nearly 30 yrs old. All functions are working perfectly and its keeping time to approximately 1 second a day. To the naked eye it looks to be in very nice cosmetic condition. Under a bright light with a magnifying glass you will find various tiny marks and nicks. The Hardlex glass is in superb shape with no big scratches of scuffs, and only a few microscopic marks. The black bezel is also very good with only a few minor scratches and indentations. The tachymeter numerals are all nice and crisp. The case and strap are very good all over with just the odd sign of wear. The clasp has few marks on it, that you can just make out in the photos. 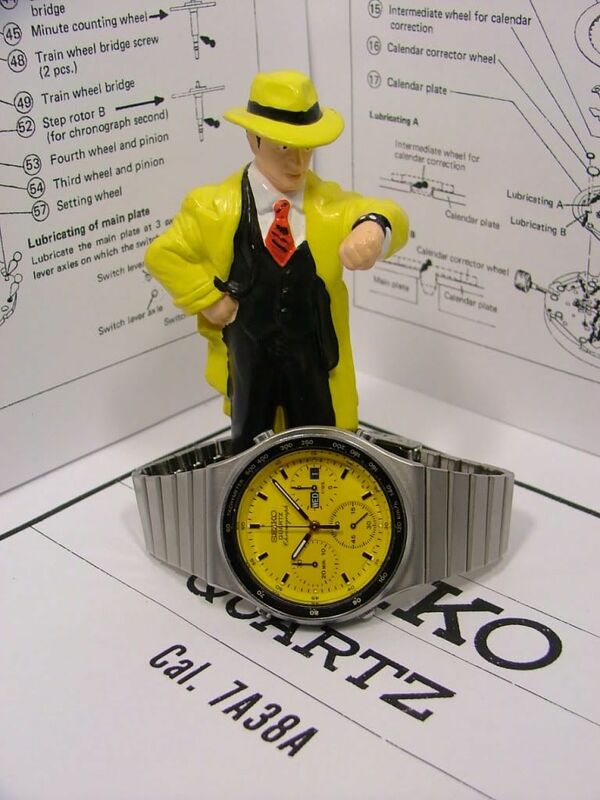 The quartz movement is very clean and original. The strap is very large and will fit on a wrist up to about an 8.25 inch. The watch weighs approx 95g. Towards the end of the 5-day auction the following amendment to the description was added. Thanks for all the emails pointing out my enormous cockup getting the cal number wrong .. Doh !! 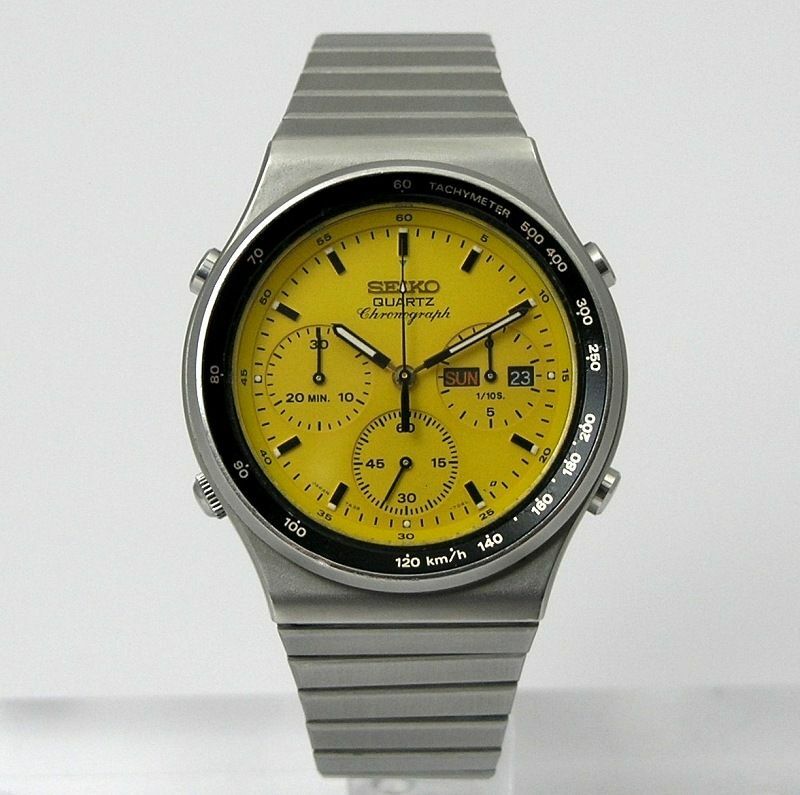 It should have read Seiko 7A38 … my loss, your gain. Also, I'd prefer to just let the auction run rather than accept any of the tempting offers. Didn't seem to make much difference - the listing still received 582 views over the 5-day period. Sold for a respectable £566.00 after 28 bids, jumping from £479.00 in the last few seconds. 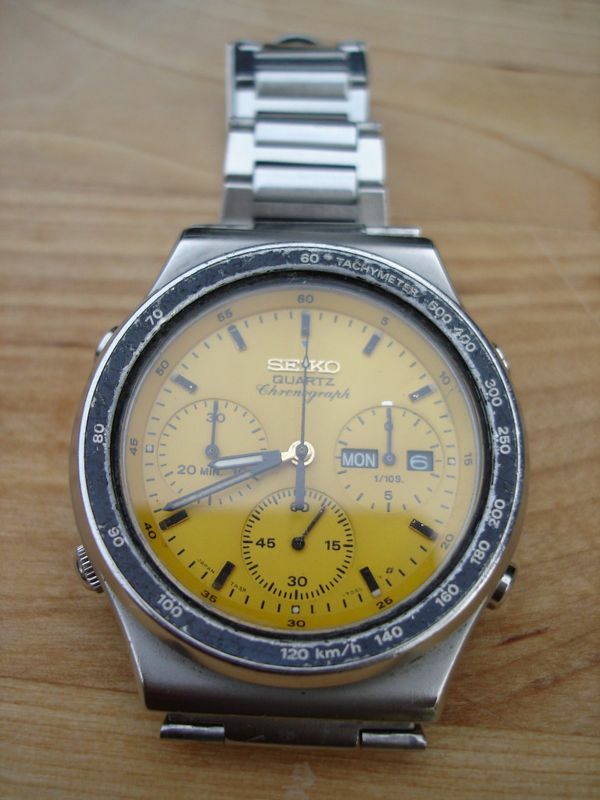 I think I'm going to have to get my 000 paintbrush out and retouch those couple of marks on my bezel. 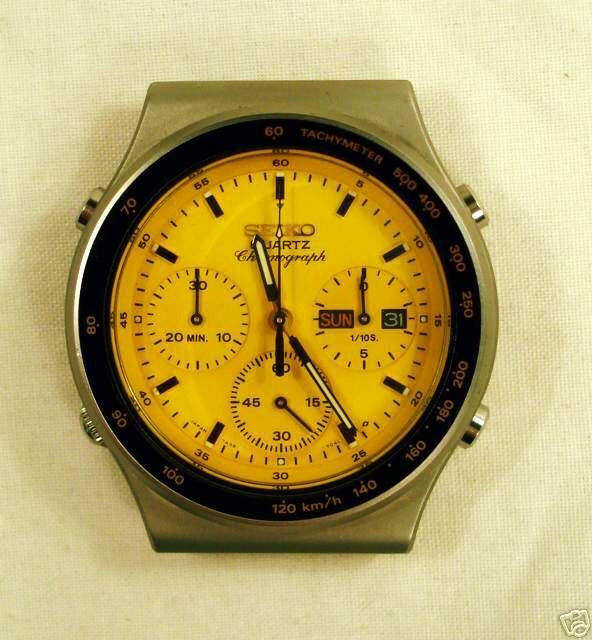 Indeed, looking closely at the eBay listing photos again, either the watch itself, or the photos appear to have been retouched. Here's a a selection of images from a few even older eBay listings, that I've right-clicked and saved. $330.98 + $25 P&P. At the time that was £178. Then I had to pay DHL the dreaded VAT, duty and collection charge. I skipped out of the DHL office like a 5 year old. 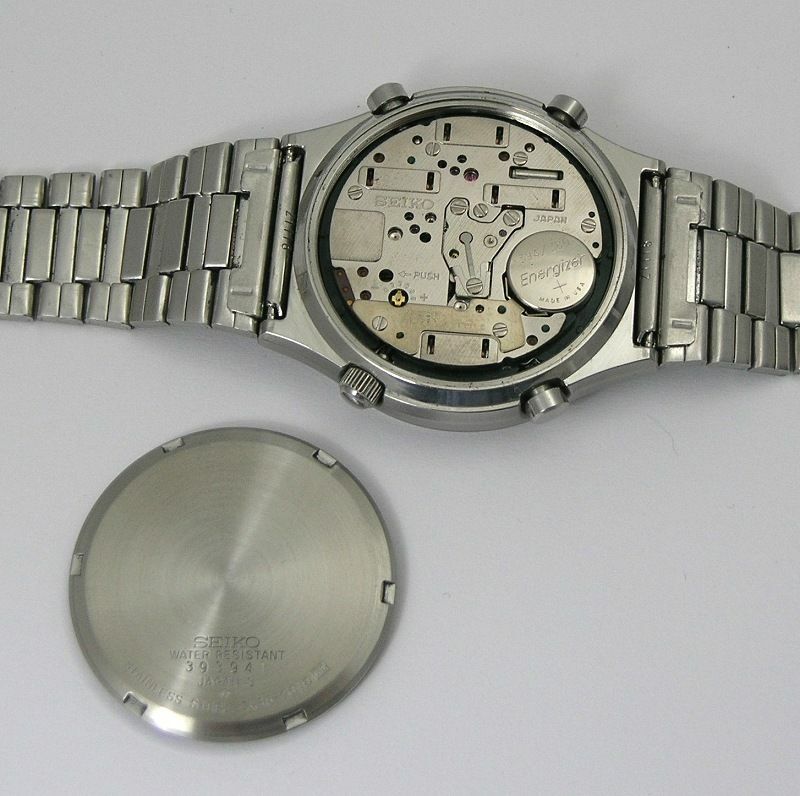 The next example was also listed on eBay, sometime in 2007 - with the p/n Z1118S bracelet shown separately. 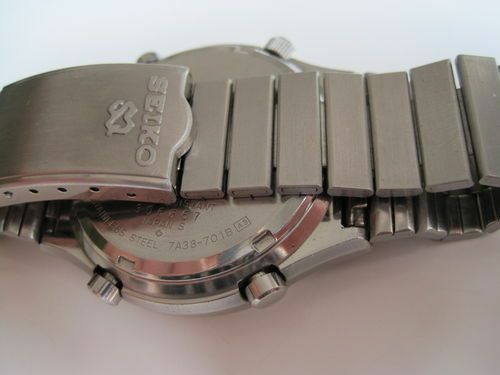 http://www.thewatchforum.co.uk/index.php?showtopic=20812 entitled: Vulcan Bomber Crew Seiko 7A38-701B Crikey!! But if it was, then it sold for £870 ! Those were the days when the Vulcan myth still prevailed, and people paid silly prices. Despite being in less-than-pristine condition, and without bracelet, it still sold for a very respectable £515. most of the photos of Vulcan's that I'd posted in that thread are long gone - and I have since re-organized my Photobucket account. 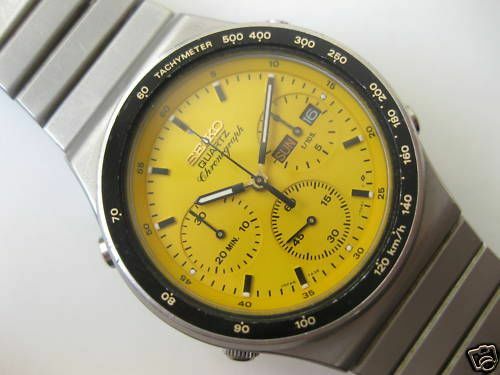 Nice vintage yellow dial Seiko 7A38 chronograph. 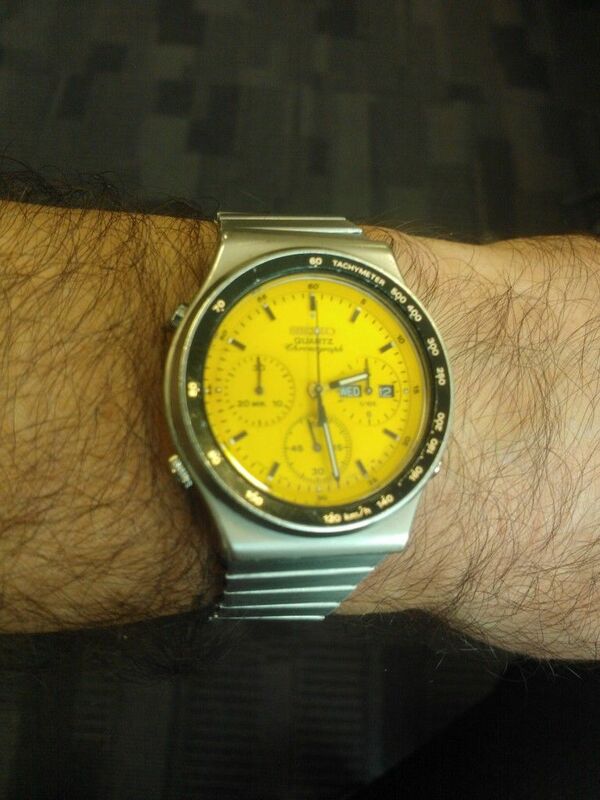 It’s in working condition but the large chronograph hand needs attention. It often takes a few seconds to start running after the chrono is started (then it resets to a corresponding number of seconds before "0" when reset). Everything else works fine and it’s keeping good time. 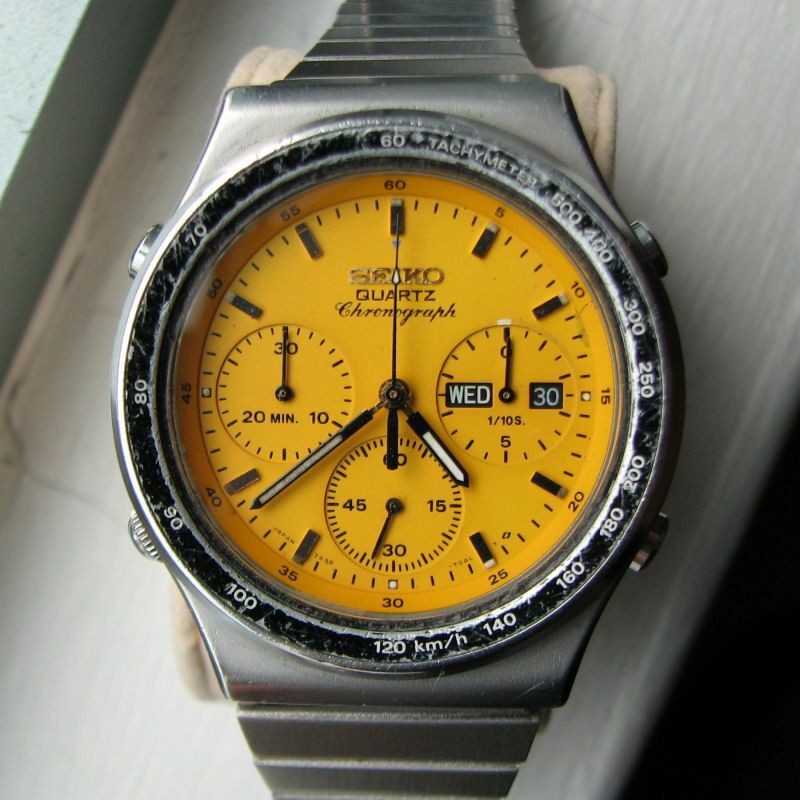 It’s in used condition and has the usual dings and scratches throughout that one would expect of a watch of it’s age (mid 80’s). These watches have the same high grade quartz movement in them as the very collectable military RAF 7A28 watches (but with the addition of a day and date window). 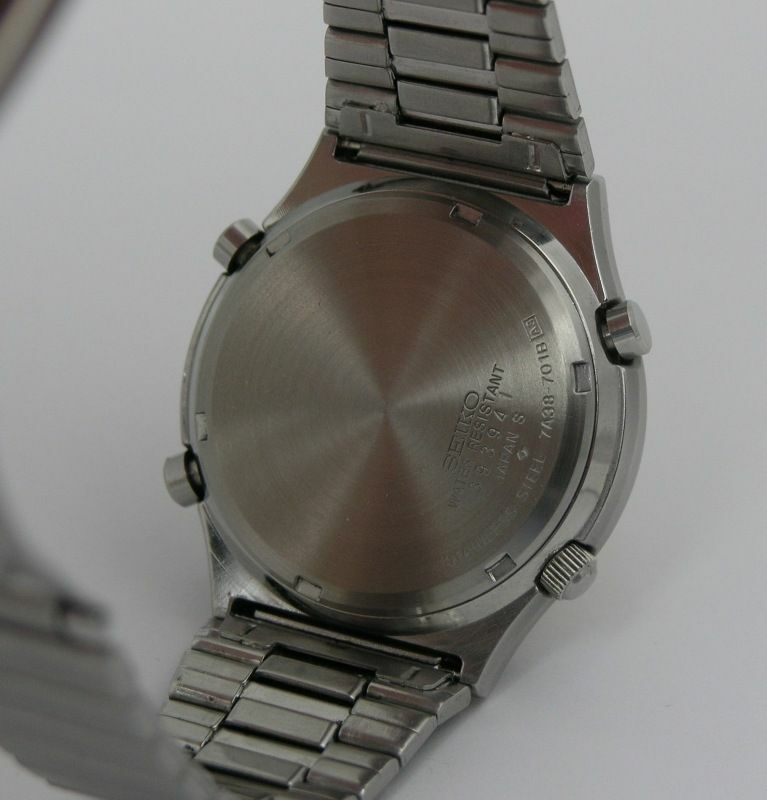 It's made from solid stainless steel and is signed on the caseback, movement and clasp. Payment to be made by PayPal within 5 days of the auctions end. It will be posted in a sturdy box with plenty of bubblewrap within two working days of receiving payment. Postage will be £12 within Europe. Outside of Europe will £14. This includes tracking number and signed for delivery. To quote a previous poster on RLT: .... had a little 'play' with this for a while on the bay. It sold for £333.51 after 28 bids, jumping from £231 in the final dozen seconds of the auction. The listing received 646 views. 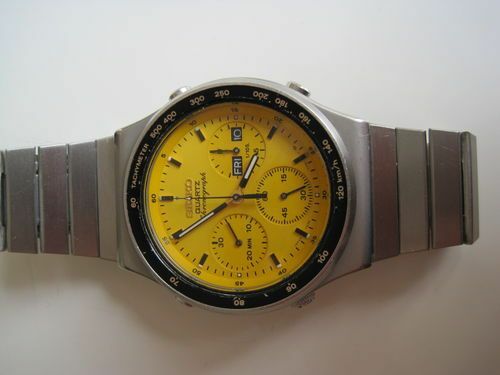 So .... anybody here caught 'Yellow dial Fever' and want to talk about 'Vulcan's ?? 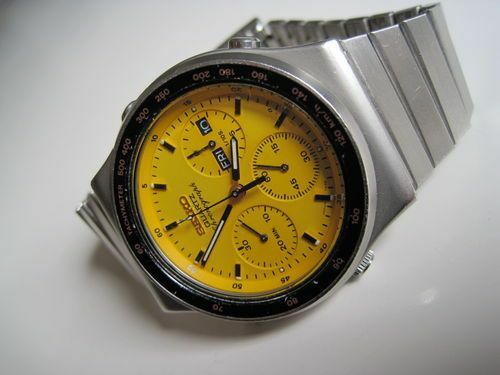 Yes, I'm infected by a "Yellow dial fever" but I don't want to talk about them....I want to get one!!!!! Sorry, John. 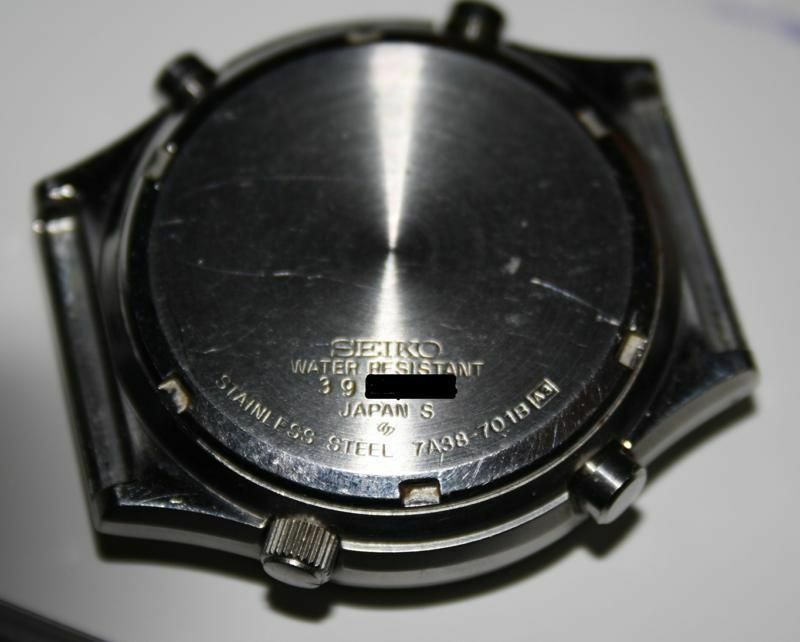 No idea of production numbers, because of the way Seiko allocate serial numbers on a monthly basis (to more than one caliber-model). I suspect they were fairly low volume, and something of a 'toe-in the water' exercise, with the bright yellow coloured dial. I've seen 7A38-701B's with case-back serial numbers beginning 38xxxx - August 1983 (the first month any 7A38's were manufactured), through 39xxxx (which appear to be the most numerous), 3Oxxxx and 3Nxxxx. I thought I'd seen a 3Dxxxx - December 1983 somewhere, but I just scrolled through my photo folder (twice) and not found any evidence of it. So it looks like a fairly brief 4-month production run. Well, that 'toe in the water' test worked for me back then! !...it was love at first sight!! As this thread is likely to become the reference topic for our forum, I guess I ought to 'put a stake in the ground'. Size: 39.5mm diameter (excluding crown and pushers) x 43mm over lug ends x 11mm deep - 20mm lug width fixing. 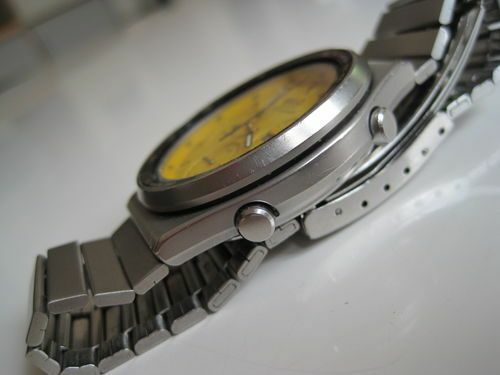 Case and bracelet are common to the 7A38-7010 and 7A38-701A, but each uses a slightly different bezel (inlay colours). 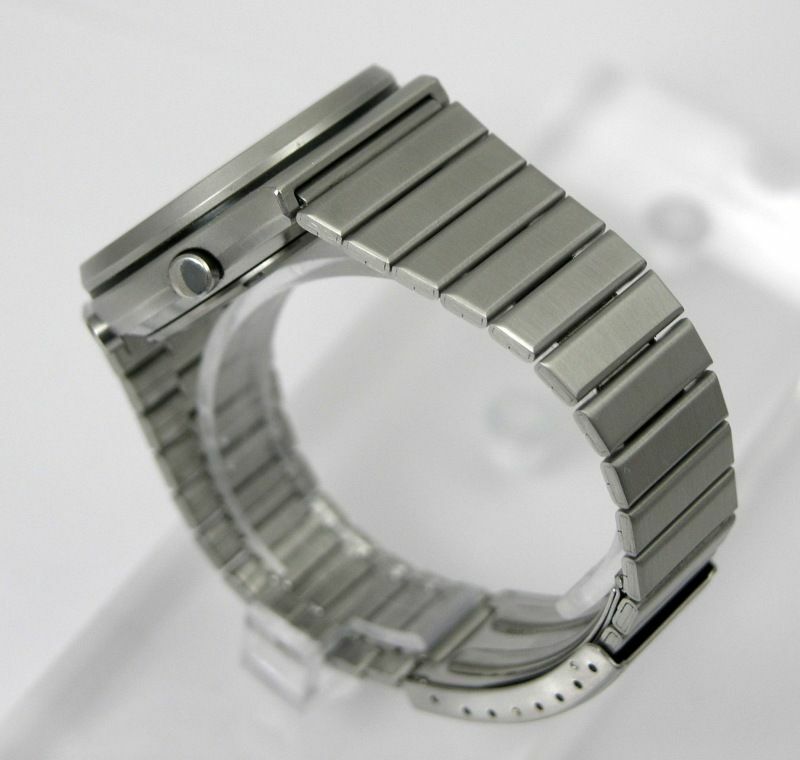 Case material: Stainless steel – matt silver anodised finish all over, apart from case-back. Pushers and crown are polished. 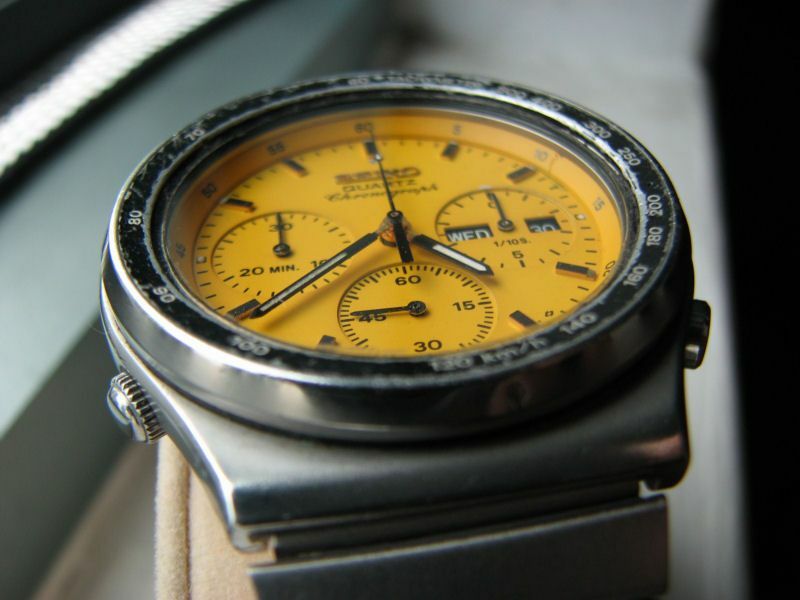 Fixed external Tachymeter bezel with black enamelled inlay and all gold lettering: ‘Tachymeter’ and numbering. 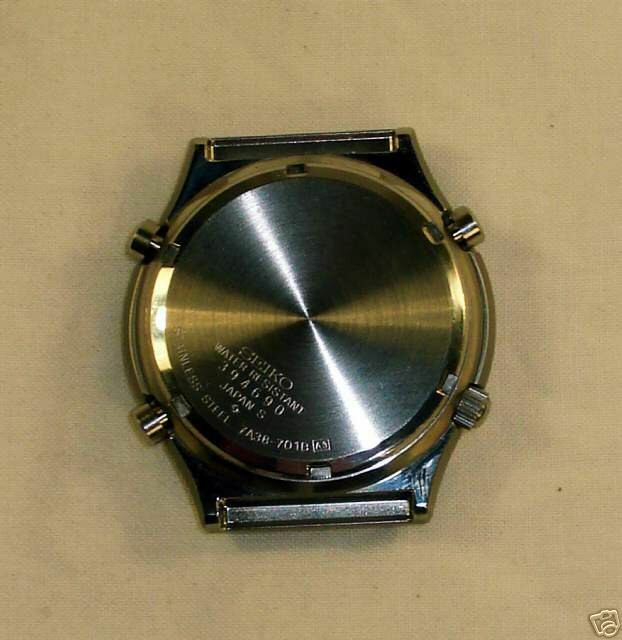 Dial: Part number is 7A38704LXY18. 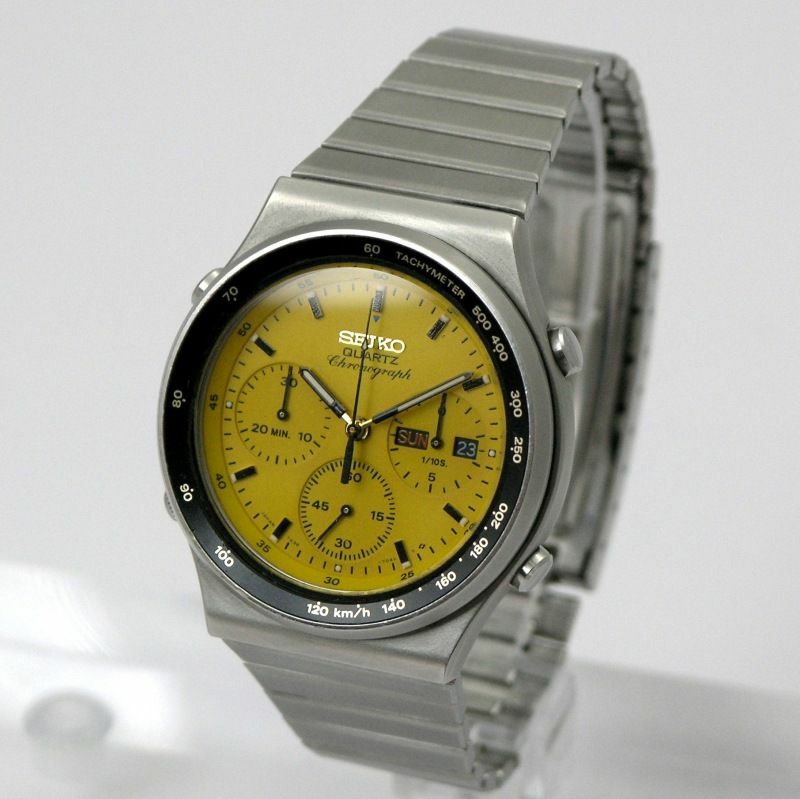 Seiko's database shows it as ‘BROWN’. It is most definitely Yellow (with black printing). 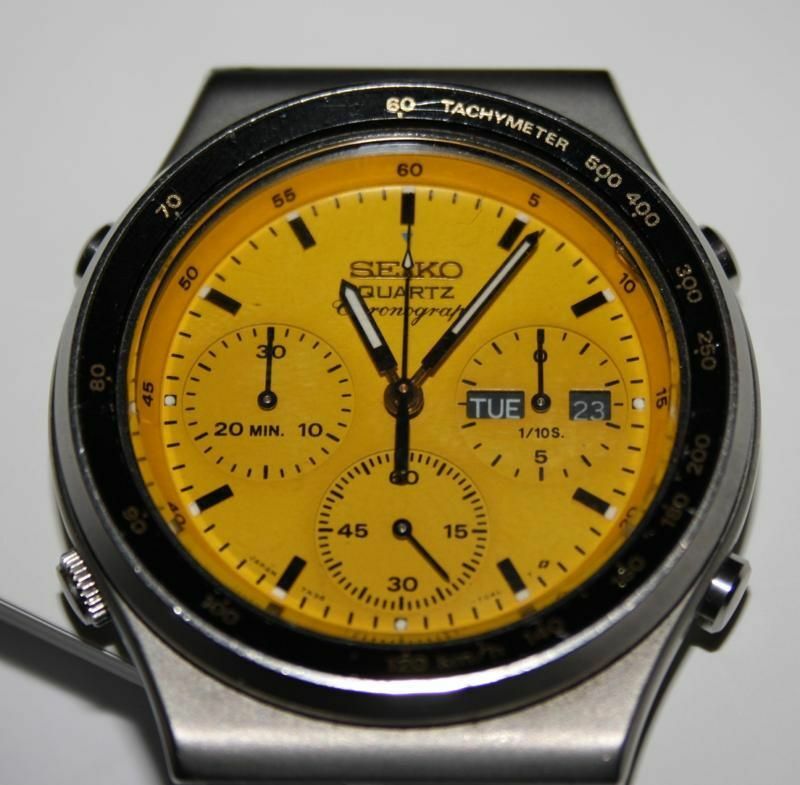 Dial markings: SEIKO (gold-plated logo), QUARTZ Chronograph. 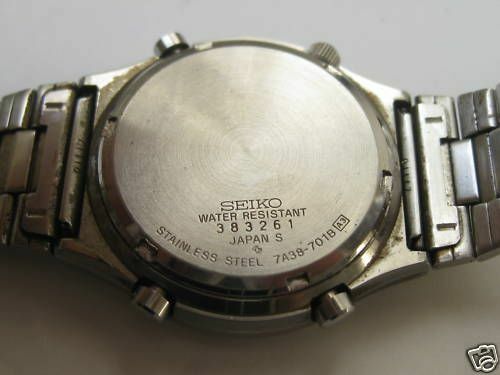 At the bottom: JAPAN 7A38 704L T Suwa symbol. There is a small mid-blue inverted triangle mark under the 12 o’clock baton. 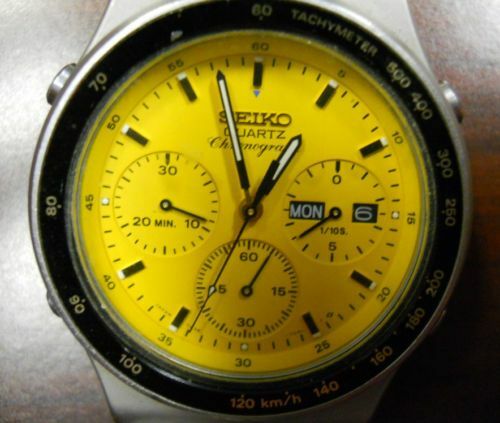 The yellow minute dial ring is marked 5 though 60. Hands: Main handset is black (with lume) and gold bosses. Sub-dial hands are all black. 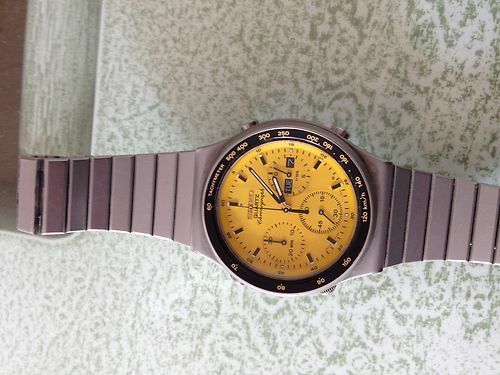 Despite the ‘RAF Vulcan’ myth and various rumours of these watches having turned up in MOD surplus stores, and being supplied in plain brown (waxed) cardboard boxes, none have ever actually been seen stamped with military markings – NSN / issue numbers, etc. 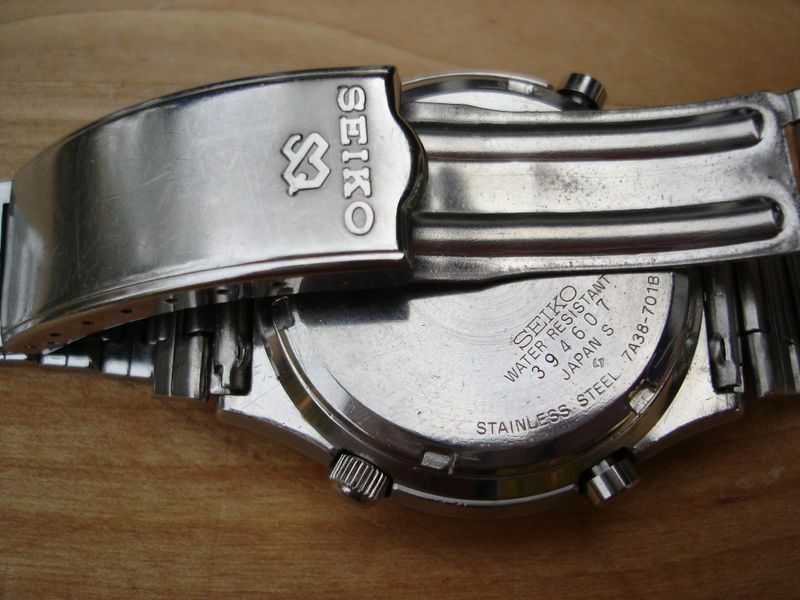 Seiko bracelet p/n: Z1118S – fixing tube is stamped Z1118. Finish is matt silver anodised to match watch head. Tapers from 23mm wide at the shoulder to 16mm. Fixing by 20mm x 1.5mm Ø spring bars. 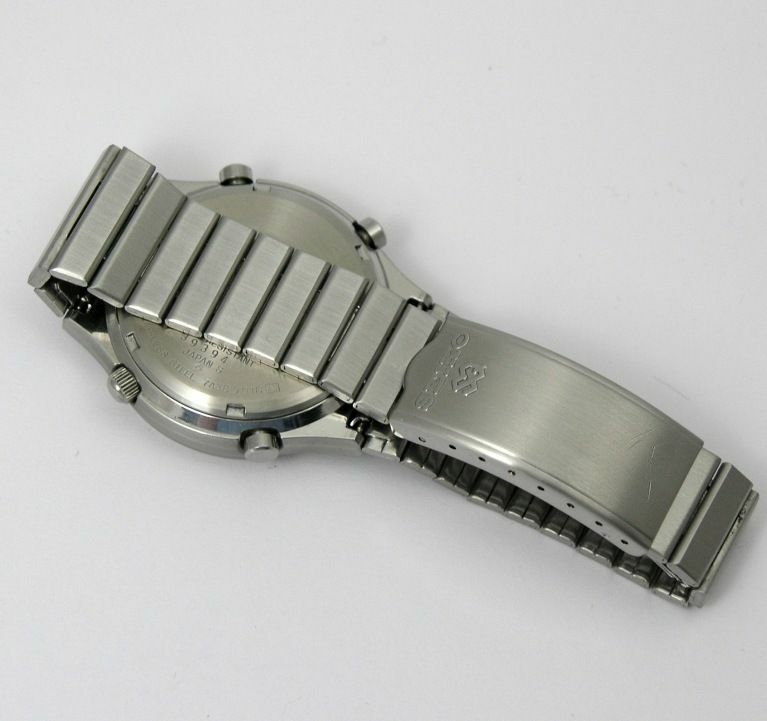 Production variances: None seen, apart from slight differences in edge treatments on some Z1118S bracelets. Production dates: Examples seen have serial numbers beginning 38xxxx through 3Nxxxx. (August – November 1983). Geography: Seem to turn up pretty much worldwide - particularly in Europe. 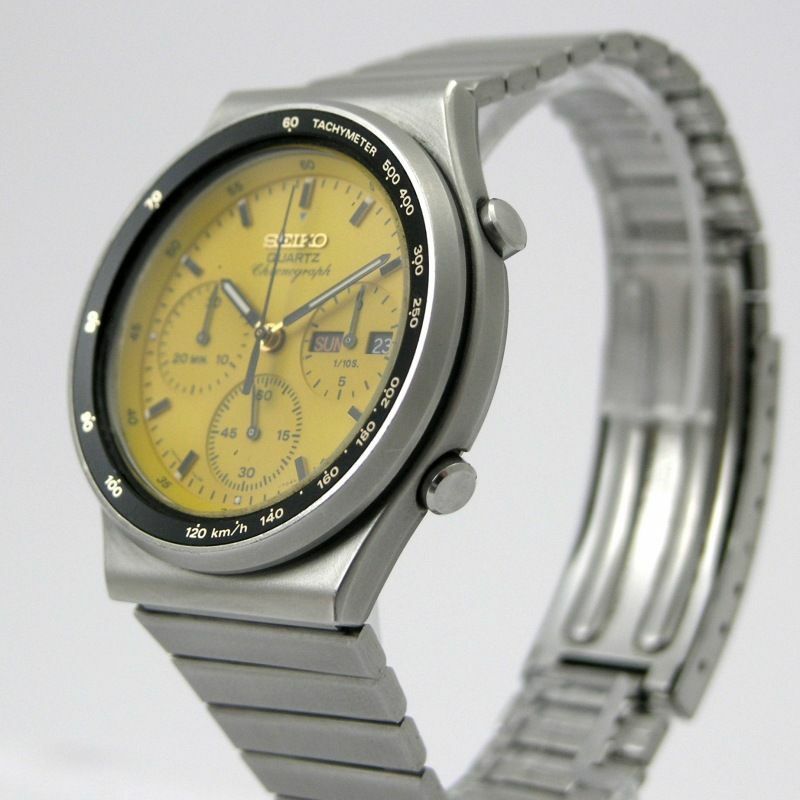 Buyers Tips: Original Seiko p/n Z1118S bracelet is prone to stretching, so beware of non-original bracelets. 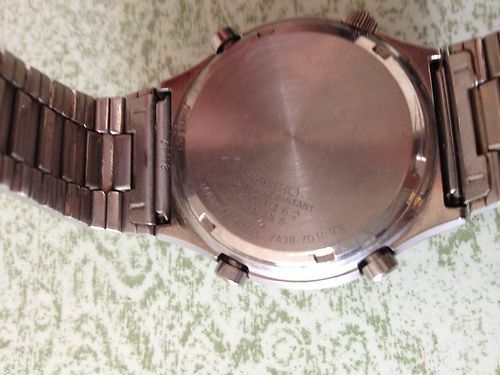 Price Guide: $100 - $750 dependent upon condition (beater / parts watch –> mint). the above terrible photo doesn't do the watch justice - my phone camera takes the WORST pictures I've ever seen. I'll take some better pics when I get home. Strange that it should have come fitted with the 25mm long 5-hole SQ clasp, Simon. Every other 7A38-701x I've seen (that's been still fitted with the original p/n Z1118S bracelet) has also had the longer 35mm 7-hole SQ clasp fitted. Yet that bracelet looks 'right' to me. Don't be in too much of a rush to fit that replacement Sternkreuz XMF300.860 crystal. While you've got the old crystal out, it's an ideal opportunity to touch up any missing enamel on the inner lip of the bezel. I use a 000 paintbrush and Humbrol modeller's enamel paint. It's far easier to do this working from underneath / from inside the watch case. There's less risk of getting excess paint on the numbers, that way. I haven't done this on my own, but I have touched up one of my 7A38-7010's, and my 'beater' Vulcan resto' project. Hi, and welcome aboard. Assuming that it's 01.27 (in the morning) at night when it stops, then it's a sign it needs a service. With age, the oils in the jewels thicken, and act more as a brake than a lubricant. At 1:30-ish in the morning, the watch is halfway through the date / day change-over cycle - when it's working that little bit harder, and so placing additional load on the stepper motor / gear train which drives the hour and minute hands. Sometimes, making the watch warmer will temporarily help it get over 'sticky oil syndrome'. Try leaving it in the airing cupboard overnight and see if it makes it past 1:30.
you sir, are a genius!! i stuck the watch in the lagging of the hot water tank and it made it through to 06.45 this morning (only lost 10 mins). many thanks for your interest. 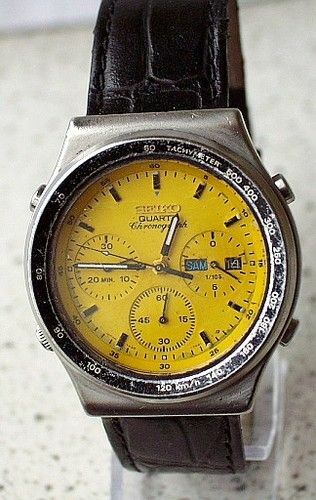 so where do you recommend for a watch service of this type? 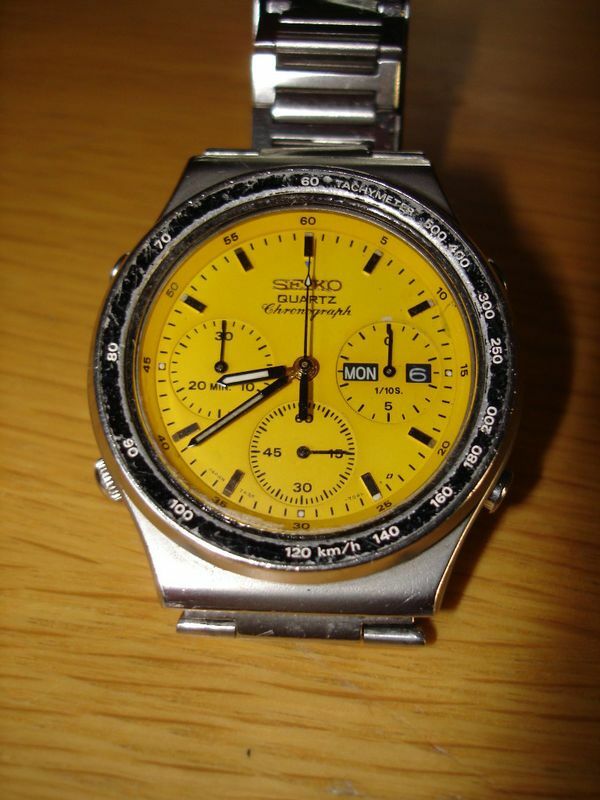 Back to Seiko, Timpsons or an independent? No genius involved - just the 'voice of experience' speaking. I've had a couple of 7A38's demonstrating exactly the same symptoms. 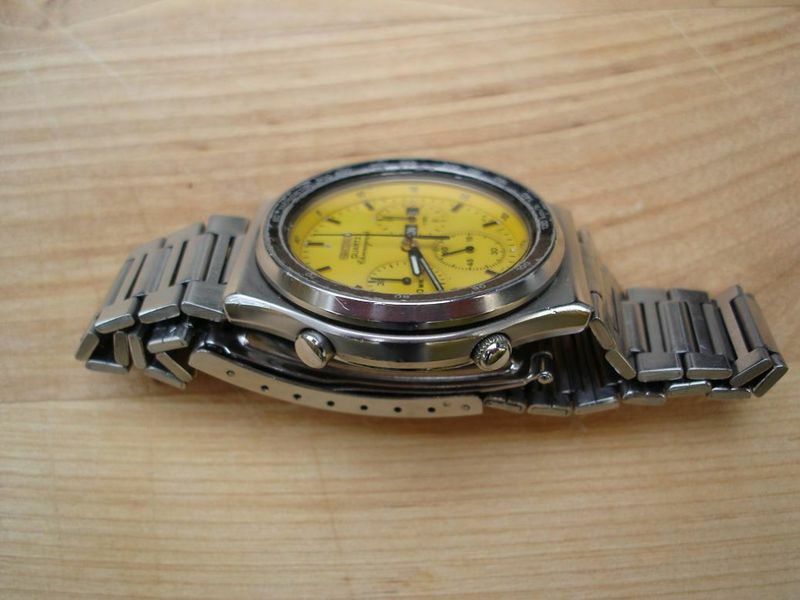 Putting the watch in a warm place is nearly always just a temporary solution. As soon as it cools, the old oils thicken again, and you're faced with the same problem. The only answer is a complete strip; clean and rebuild of the entire movement - re-lubing with fresh oil. 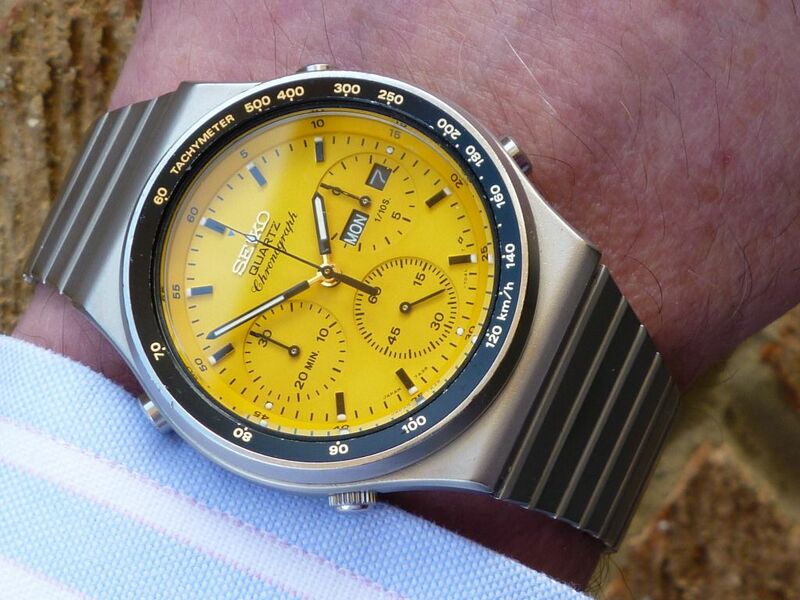 Steve Burrage of Ryte Time (who's done quite a few 7A28 RAF Gen 1's for various people), or Seiko UK themselves. They have a repair technician (Nick) who is well versed in servicing 7A's. Unfortunately it's going to cost about £90. I presume everybody saw the one that was listed on eBay in Germany last week ? -Wunderschöne Uhr, so etwas findet man heute nicht mehr, selbst gebraucht im Internet nicht zu finden. As you can see from above, there was no mention of '7A38' nor 'Vulcan', let alone the 7A38-701B model number in title or description. 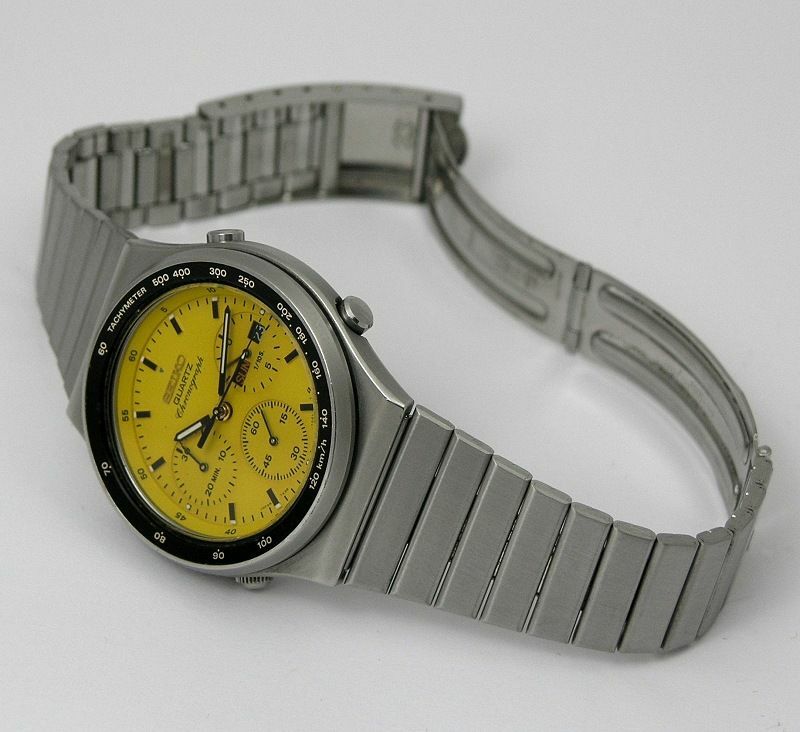 The auction ended a few moments ago, with the watch selling for a mere 396.00 Euros (approx. £313.27) after only 17 bids.